Spacious Home,Hot Tub 8 Unlimited SHARC Passes, Newly Upgraded 2017!! Shagbark #20 is a spacious vacation dream home with a grand living area that leads to the dining space and fully stocked kitchen. 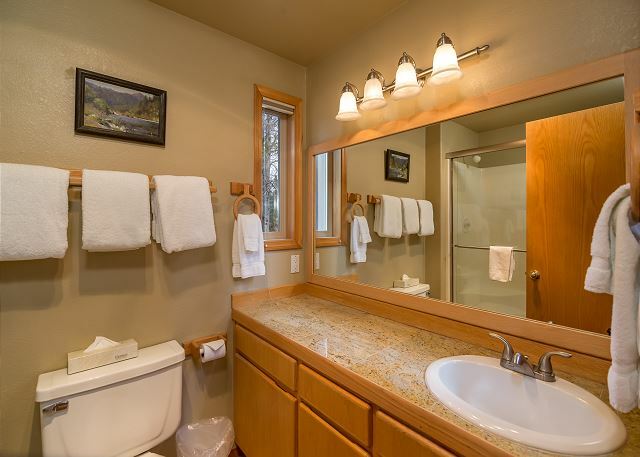 Recently upgraded this home has a warm inviting feel perfect for your family vacation. New living room furniture in 2017 with 60" flat screen coming in March! Brand new Bedding throughout home and many upgraded kitchen items including all small appliances. 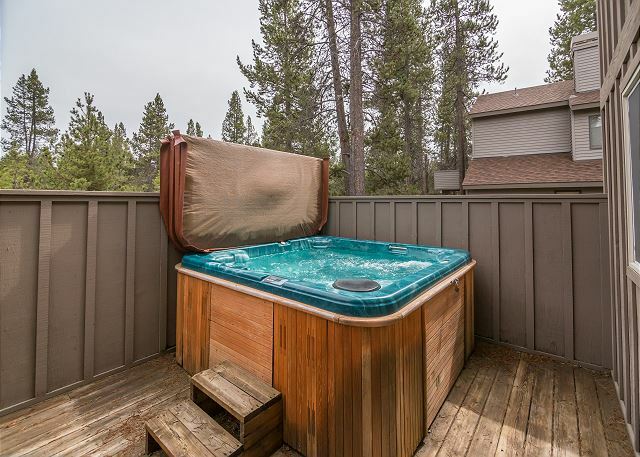 The back deck offers lawn chairs and outdoor furnishing with a private hot tub. All of the bedrooms have brand new bedding in 2017! 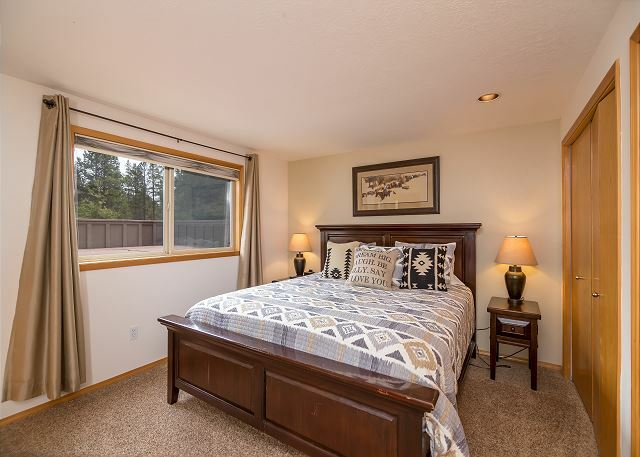 The Master bedroom downstairs has a California king. 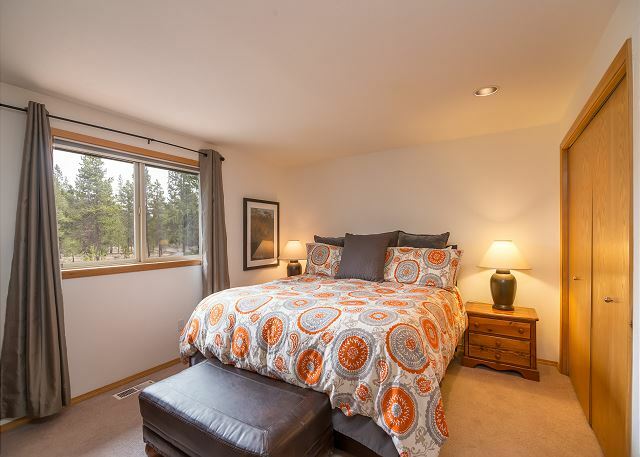 The two bedrooms upstairs also have California king beds and one of them is a Master suite as well . The 4th bedroom/game room has a set of bunks with a twin bed on top and a full bed on bottom, a queen hide-a-bed and a foosball table. Perfect place for the kids! 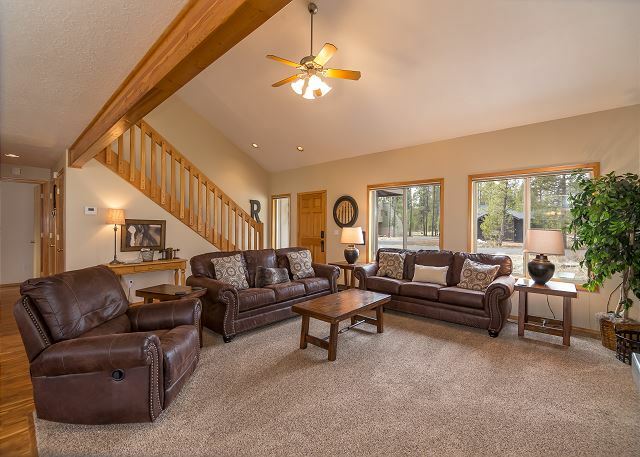 This home provides 8 Unlimited SHARC passes, free tennis and free access to Sunriver Marina! 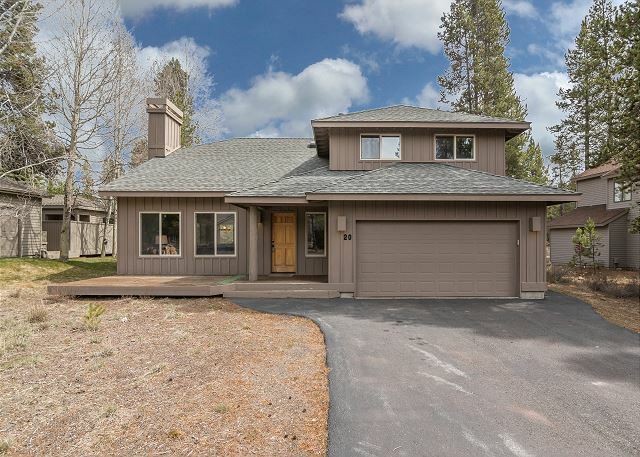 Located at the north end of Sunriver, close to the north store and Woodlands Golf course. 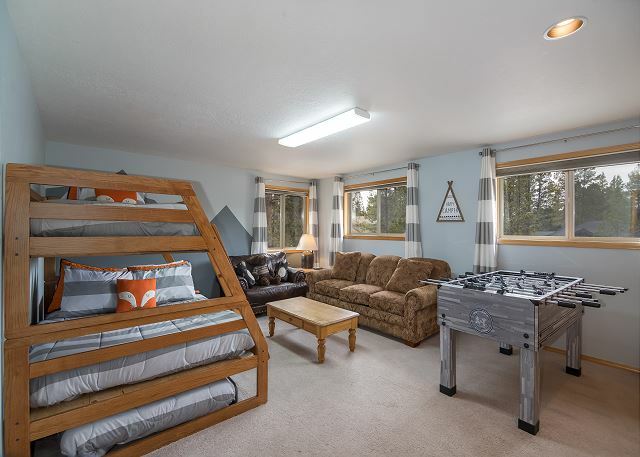 3 California Kings,1 Twin/Double Bunk, 1 HAB, 3 TVs/2 VCRs, 3 DVD players, foosball table, 1 Pack-n-Play, 1 High Chair, D/W, W/D, microwave, 2 levels, gas fireplace, HOT TUB, gas BBQ, garage, 10 bikes, 2090 sq ft, 8 Unlimited SHARC passes. We had a great time at this property. 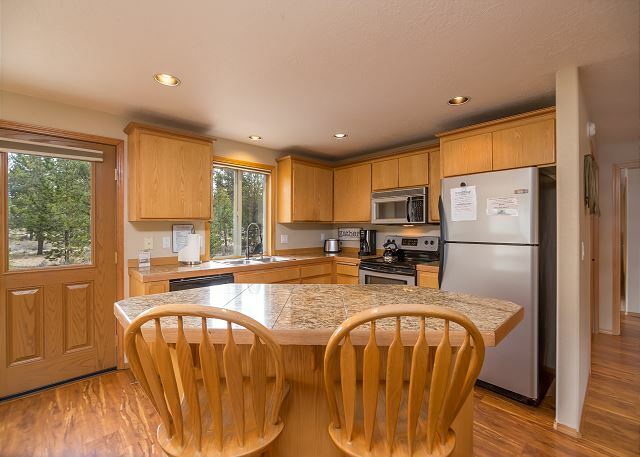 The property was clean, the kitchen well stocked and the layout was perfect for our family. Thank You for your 5 star Review, Claire. We are so happy to hear that this home worked well for your group and that you found it to be clean and well stocked, come back soon! Thank You for your 5 star Review, Ha! So glad you had a wonderful stay and want to come back, We hope to see you soon! The house completely met the needs of our family which was 6 adults and 4 children. 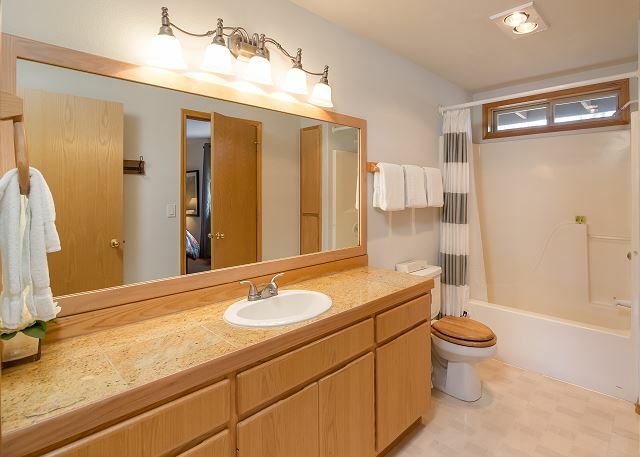 Having a bathroom off the 3 main bedrooms was such a plus. The furniture was very nice and the kitchen well supplied. Thank You for the 5 star Review, Mary! We are so happy to hear that this home was a great fit for your family, come back soon! Relaxing spacious and well appointed home with everything you need. Thank You for your wonderful review!! We hope to see you again in Sunriver! Awesome vacation, home was just as described, worked great for multiple families, arriving at various times throughout the week. Very clean and comfortable beds. Only thing i missed was air conditioning - we were there mid-august and it got really warm - but did cool down at night. Property manager very helpful and easy to work with. Thank you for your review Shelley! We're happy you enjoyed your stay at Shagbark #20. We did have a very hot summer, opening the windows at night does help to keep the homes cool. We're glad you enjoyed your vacation and hope to see you next time! This was a great house, with plenty of room for all of us. Nice big beds and plenty of space. This house does not have air conditioning but we spent most of the hot hours at the pool anyway. This house is close to Fork Rock park. Thanks for review Stephanie! We are so happy that you enjoyed you time in Sunriver and we hope to see you again soon! 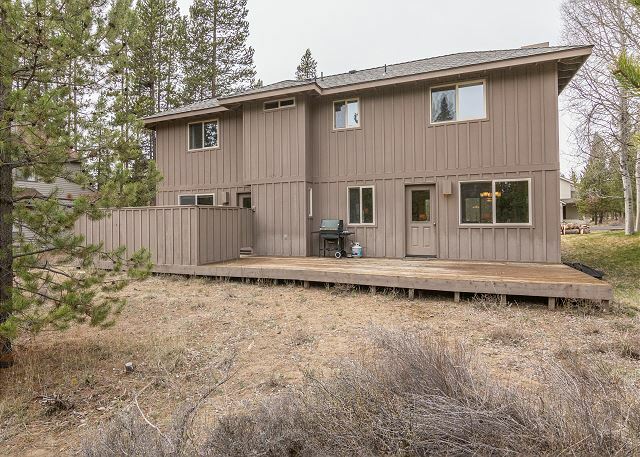 Regarding the A/C, most homes in Sunriver do not have it. Our housekeeping staff would have been happy to bring some fans though. Thanks again! The phrase "perfect for us" was heard several times as my husband and I enjoyed our stay with our sons, families and our daughter and her boyfriend. The kitchen is well stocked, the beds with nice linens and roomy living space , made our stay very enjoyable. Thanks for the great review Leann! We are so thrilled that you enjoyed your stay. Please come see us again soon! Our experience here was very positive. 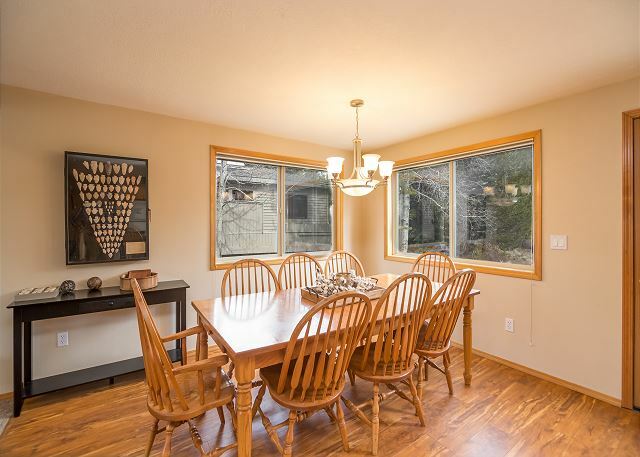 This home has a large open area for dining and entertaining. We had a large group gathering here and we were able to accommodate all 18 of us. 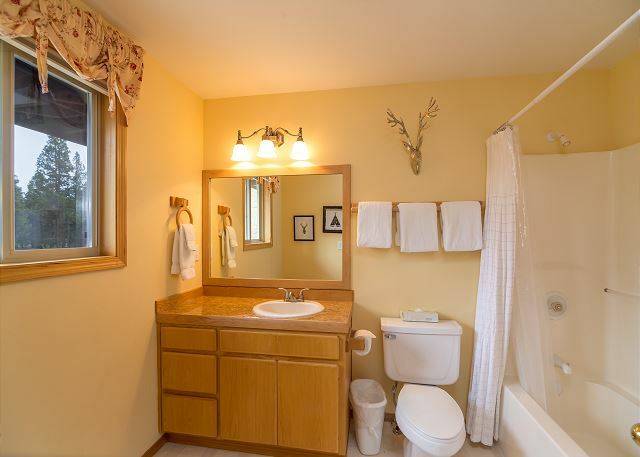 Three out of the four bedrooms have attached bathrooms which is nice for couples. The only negative is that we had a hard time finding large containers for serving. Also, it would have been nice for this price to have the kitchen come with foil, plastics and more silverware. And just a reminder that it is not air conditioned. Thanks for your feedback, Raymond! We are so glad that you had a good experience with your family at Shagbark 20. It is our foremost goal to have our visiting families make Sunriver part of their family traditions. As far as stocking the home with enough silverware/serving dishes/etc, since the home holds 10 people maximum, we normally stock it for 1 1/2 times the number of people that would be staying in the home. In your case. you also rented Blue Goose 16, so we recognize that you were split between the two homes but gathering for family affairs at Shagbark 20. You had just a couple of people over what we stock the house for, so I apologize that it was a little short on a few things, bearing in mind that it is stocked according to the maximum occupancy of the home. 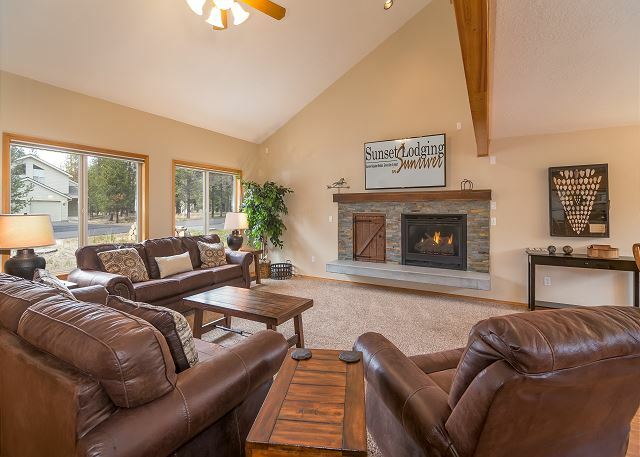 On a separate note, we're hoping that you made lifetime memories between those two beautiful homes and Sunriver in general. And we hope to have the privilege to host the Sievert Family Reunion for many years to come! I arrived early and the automatic number lock did not open with the number code I was given. A worker was there and helped me get in. The heavy number lock mechanism hanging from the front door was a pain in the neck. The house was a good one, we were satisfied with it for the price we paid. Sorry you had trouble with the lock David. They don't work until 4pm and sometimes guests arrive a little early and try them which, after a few tries, then disables the lock. We are glad that one of our staff was there to help! And we hope to see you back in Sunriver soon. We stayed in this house 13 years ago and noticed the SAME furniture is still there in 2016: the couch creaks and the legs fall off. Other than that, it's a great house! The great room is big enough for eight people to eat together, play games and build Legos (what we do for fun). The home has a playpen, high chair, several standing fans, nine bikes (not ten as advertised; number ten is securely locked onto a wall), pool passes, and extras like a blow-dryer and tea pot. We will stay again! We are so glad you enjoyed yourselves Thelma and Mark. We look forward to hosting you again (hopefully sooner than 13 years!) Come back and see us again soon. Great house for two family's with lots of room. House was clean, comfortable, and well equipped. Glad to hear that Shagbark 20 worked well for you Georgina! And we are very grateful for your feedback and for your business. We hope that you will get back to Sunriver soon!. Had a wonderful family vacation again!! Did everything we wanted to. Biked, hiked, swam, rode horses, and just plain had fun. We come back every year, and are looking forward to the next trip already. AWESOME! Connie, we are a family ourselves and we take GREAT pride in nurturing our guest famlies, knowing exactly what they'll need to be comfortable, happy and have extremely valuable family time together. We're counting the days 'til next year right along with you! We wanted a home close to our home and this was available across the street. Our only complain was it is not airconditioned and not enough fans for each room. The price was right. This house was perfect for the 10 of us. There was plenty of everything we needed. The weather was hot, and this home doesn't have air conditioning, but the nights cooled down fine. It is in a good area, really close to the North Store. The house is in great shape. We will definitely rent this house again. Very nice home. We had nine in our party and there was plenty of space. Mavericks access is a great perk & ultimately why we chose this unit over another unit that looked just as nice. We had a couple of minor issues that were taken care of immediately by the management company, they were courteous and efficient. 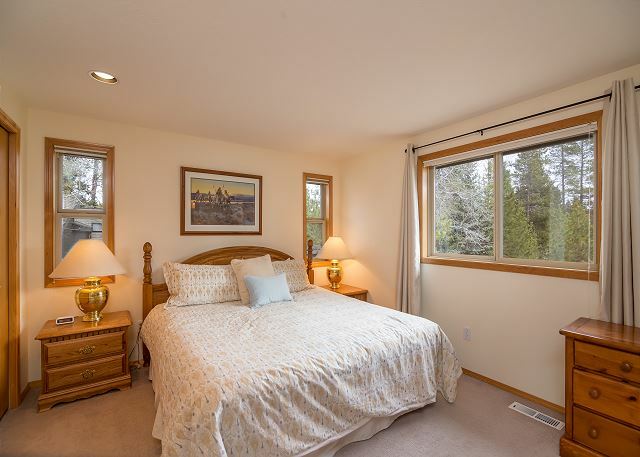 Three suggestions that would make this rental perfect: get a large TV for the family room, improve the bikes and get rid of the sofa sleeper in the upstairs bedroom & add 2 or 3 more twin beds. I would stay in this unit again. We had a great time. Thank you for the great review and for your suggestions! We are happy to hear that you enjoyed the home and made good use of the Mavericks access! Thank you for the compliments to our Staff, we work very hard to ensure that we are doing our part to to take care of our guests! Hope to see you again soon!